YES BUT IS IT LOVE? I adore my dog. And looking into those deep brown eyes so convinces me that he adores me right back. But does my dog really love me? Or is he maybe just hoping for a treat? What is love anyway, biochemically speaking? The main part of the human brain which is stimulated when we fall in love is the caudate nucleus, the most primitive reptilian brain area. The more modern cortex area struggles to interpret this primitive emotion and responds by creating a narrative around the feeling and responding to that. Love in humans also causes a lightning fast surge of chemicals such as oxytocin, dopamine, vasopressin and opioids. These chemicals facilitate emotions like bonding, happiness and contentment by stimulating the reward centre of the brain, producing that feeling we call love. Does this happen in a dog’s brain? There have been quite a few studies done on the subject of love in dogs. Animal cognition scientists at Emory University trained dogs to lie perfectly still in an MRI machine. Then, (because dogs are ruled by their noses to a very large extent), they subjected each dog to a variety of odours and measured the activation of the reward centre of the brain. They finally found that, without exception, the most favourite odour of all (yes, even above food) was the odour of their particular human. In addition, a Japanese scientist measured oxytocin levels in the brains of dogs before and after looking deeply into the eyes of their owner. Not surprisingly, he found that the oxytocin levels jumped 130% higher in both the dogs and the humans. Another scientist found that physical contact between a dog and its human dramatically increased the level of dopamine in the dog’s brain. 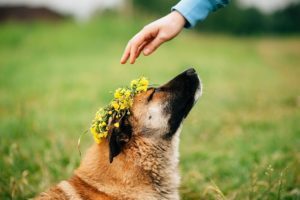 What does this mean – does my dog love me? If we define love as the stimulation of the brain by oxytocin, vasopressin, dopamine and opioids, and all of these occur in dogs as well as humans, then we must conclude that dogs do feel true love. Carter CS, Porges SW. The biochemistry of love: an oxytocin hypothesis. EMBO Reports. 2013;14(1):12-16. Kolb B, Whishaw IQ (2001). An Introduction to Brain and Behavior (1st ed.). New York: Worth. pp. 438–441. ISBN 9780716751694. Richard JM, Castro DC, Difeliceantonio AG, Robinson MJ, Berridge KC (November 2013). “Mapping brain circuits of reward and motivation: in the footsteps of Ann Kelley”. Neurosci. Biobehav. Rev. 37 (9 Pt A): 1919–1931.